ArthroMax Advanced with NT2 Collagen & AprèsFlex: Nutrition, joint health, and joint comfort are intimately connected. So we formulated ArthroMax® Advanced NT2 Collagen™ & AprèsFlex® to provide focused nutrients for joint health, comfort, and connective tissue support. This comprehensive joint health supplement was developed from the ground up to ease your range of motion and support joint health. AprèsFlex® boswellia — this plant extract inhibits 5-LOX enzyme and leukotriene B4, inflammatory factors that affect ageing joints. Boswellia compounds have been shown to bind directly to the 5-LOX enzyme, inhibiting it from promoting inflammation. Undenatured NT2 Collagen™ — NT2 Collagen™ is a novel form of undenatured type II collagen. Clinical trials show that undenatured collagen helps relieve joint discomfort and encourages healthy, comfortable joint function. One double-blind, placebo-controlled study on patients found that UC-II® provided relief by 33%, and increased joint comfort scores by a remarkable 40% – in just 90 days! Glucosamine and boron — ArthroMax® also provides glucosamine and boron to support the underlying structural foundation for joint and cartilage tissue. 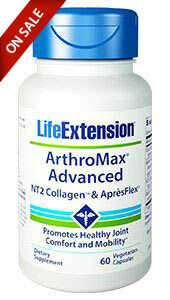 Try ArthroMax® Advanced NT2 Collagen™ & AprèsFlex® for yourself today! NT2 Collagen™ is manufactured by Bioibérica. AprèsFlex® is a registered trademark of Laila Nutraceuticals exclusively licensed to PL Thomas – Laila NUTRA LLC. U.S. Patent No. 8,551,496 and other patents pending. FruiteX-B® and OsteoBoron® are registered trademarks of VDF FutureCeuticals, Inc. U.S. Patent No. 5,962,049.